It should come as no surprise to any of us that all organisms depend on their habitats for food, water, shelter, and opportunities to breed and raise young. If climate changes in a way that habitats are affected, these changes can impact all life on earth individual organisms to populations, species, communities, and ecosystems. It can alter behaviors, population sizes, species distributions, plant and animal communities, and ecosystem functions and stability. How strongly different species will be affected varies, depending on differences in their ecology and life history. Species with small population sizes, restricted ranges, and limited ability to move to different habitat will be most at risk. Similarly, different habitats and ecosystems will be impacted differently, with those in coastal, high-latitude, and high-altitude regions most vulnerable. 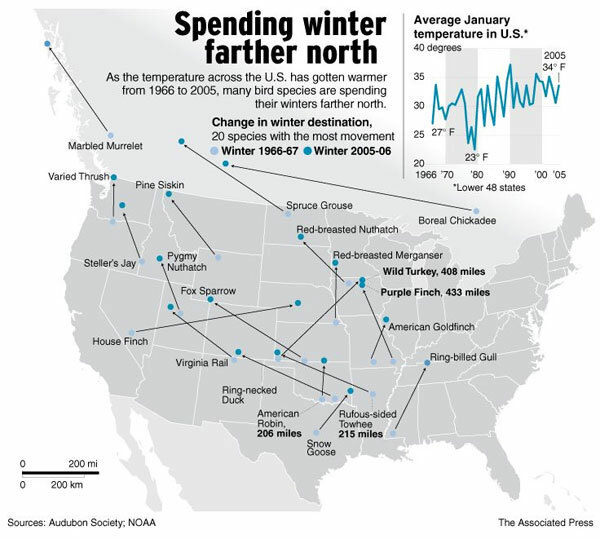 According to data collected by the National Audubon Society from over 40 years of Christmas Bird Counts, nearly 60% of the 305 species found in North America in winter are on the move, shifting their ranges northward by an average of 35 miles. Northward movement was detected among species of every type, including more than 70 percent of highly adaptable forest and feeder birds. Only grassland species were an exception – with only 38 percent mirroring the northward trend. But far from being good news for species like Eastern Meadowlark and Henslow’s Sparrow, this reflects the grim reality of severely-depleted grassland habitat and suggests that these species now face a double threat from the combined stresses of habitat loss and climate adaptation. Figure 6.83: This map from the Audubon Society and the NOAA shows where a number of bird species have traveled from their original grounds. REVIEW “What the Birds Are Telling Us” from the Audubon Society for information on how climate change affects different types of birds. The Cornell website also features the The State of the Birds.